Slark is a hero that move very fast. 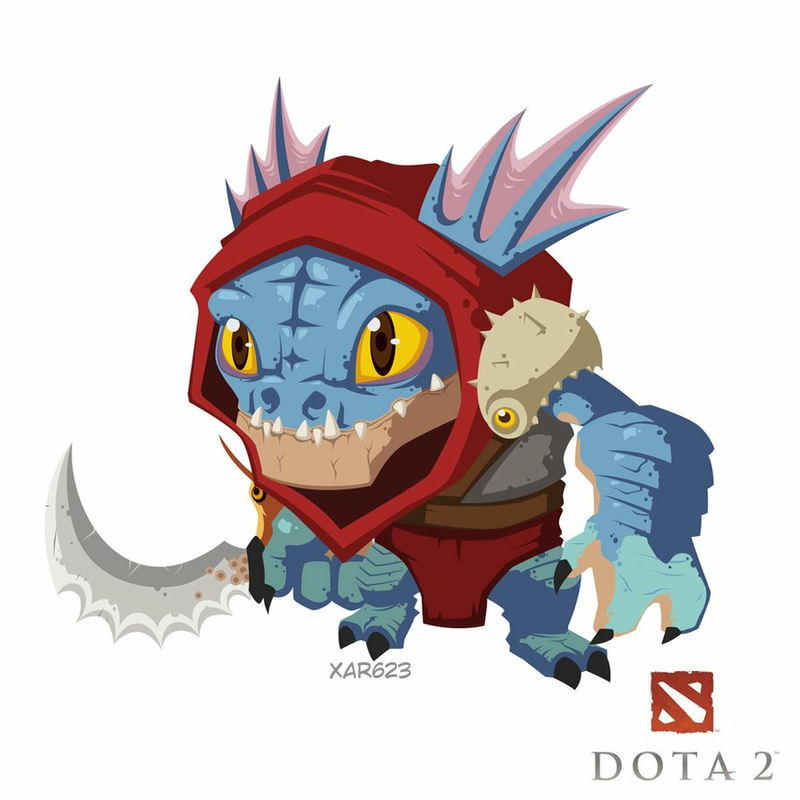 Slark is the real runner in DotA. If you don't have a decent chasing skill, then you can't never reach him. 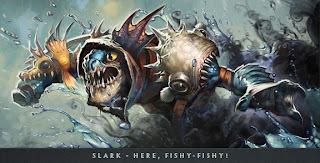 Not just fast movement speed, he also have a jump that can faster his movement for chasing a target or for escaping.Slark also can steal the opponent's stats with each attack and make him stronger while making his opponent weaker. He is considered a carry that will be stronger for late game teamfights. This is your nuking ability. Deal some damages to nearby opponents around you. A good nuking skill for farming and harassing on early-mid game. The damage is considered high for early game and you can hurt squishy heroes with it. Farming with this skill, you will deal AoE damage to enemy's creeps, this will faster your farms. And for nuking heroes, you need to be near your target and damaging him. This skill also removes buffs such as poison, track or if you already activated this skill and then get stunned, the stun will be removed immediately. This is your jumping skill. With this skill, you will catch the enemy and also can be use to escape from the enemies. 1 enemy in front of your jump will be leashed and cannot run away, and that's your chance to harass him. This skill also deal some damage that useful to harass your target. Steal enemy's stats with each attack. On the late game, this skill is so fierce, because you will get so many stats quickly and make your enemy hopeless. Like you get 30 Agility in just a few sec or something, and this stats boost will really increase your damage and attack speed so you can carry your team into victory. And your enemy will have his stats reduced and become weak and squishy. 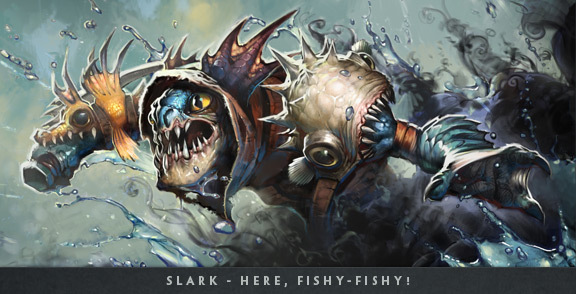 When used, Slark hides himself in a cloud of shadows, becoming invisible (attacking, casting spells, and using items do not reveal Slark). Passively, when not visible to the enemy team, Slark gains bonus movement speed and health regeneration. This is your main skill. With this skill, you can sneak attack while your body is surrounded by smoke. And if your enemy don't have true sight or AoE skill, they cannot attack you so you can act freely. With the additional movement speed, your mobility will increase so you can chase or escape from danger quite easy. You also gain a massive HP regeneration. You can fulfill your HP quickly using this skill. Why take Pounce for level 1? You need Pounce to escape if enemy wants to get firstblood by killing you. Jump out!! Or this can leash your enemy and your team can get the firstblood. Why maxed Dark Pact first? This is your main nuke, you will need this for ganking, farming, and killing or early mid game. This skill also removes buffs. Why maxed Pounce before Essence Shift? The rule of DotA: Nukes for early game, physical damage for the late game. Pounce is a nuke that will deal more damage on early-mid game. And Pounce cooldown the lower the better for mid game because you need the mobility from this jumping skill.And Essence Shift is for physical attacks that will be the main source of damages for mid-late game. On early fame, because you are the carry and needs lots of farm for buying the good items, so you need to farm as much as you can. Try to last hit every creeps on the lane, maybe Quelling Blade will helps you. Always be careful of ranged or nuker heroes harassment on early game, they are like to harass you because you are squishy and will be dangerous on the late game if not being shut down on early game. If your team want to get the firstblood, you should use Pounce to leash the enemy and attack him and nuke him using Death Pact, and also your friend will deal the damage too. On mid game you should already learned Shadow Walk. With this skill, you will get very high mobility and can escape or chase enemies easily. Not just that, you also become invisible but still can attack the enemy. This is your main skill for the game. Always use it in every situation on the match. Mobility is what you need to gank, farm, escape, or killing. In the mid game, if you want to gank, use the Pounce and leash your target and make him cannot move. Then you can attack him easily and also nuke him using Death Pact. Your attack speed is considered low on early game, maybe you need mask of madness to increase your attack speed, this item is so good because it gives attack speed, lifesteal, and also movement speed, that's all what you need to carry the game. You can also use Death Pact to avoid being stunned because the stun will be removed immediately. On late game, what you need to do is: Be brave and focus attack on single target and not attacking the creeps. Focus is the first thing to remember as a carry, if you are not focus and attack the creeps, you will waste your time. In this stage of the game, you should already have high attack speed to destroy your opponents. With the high attack speed, you will be able to gain maximum agility and stealing many stats from your enemy. With this, you will be so strong and can carry your team bravely. Pounce is still useful here, with this skill, you will leash a target and make him easy to attack. And Death Pact can be useful to remove all buffs and make you still healthy for the fight. If you already have Bkb, use that! This item will provide maximum defense from magical attacks, really helps you to survive in the hard teamfight. 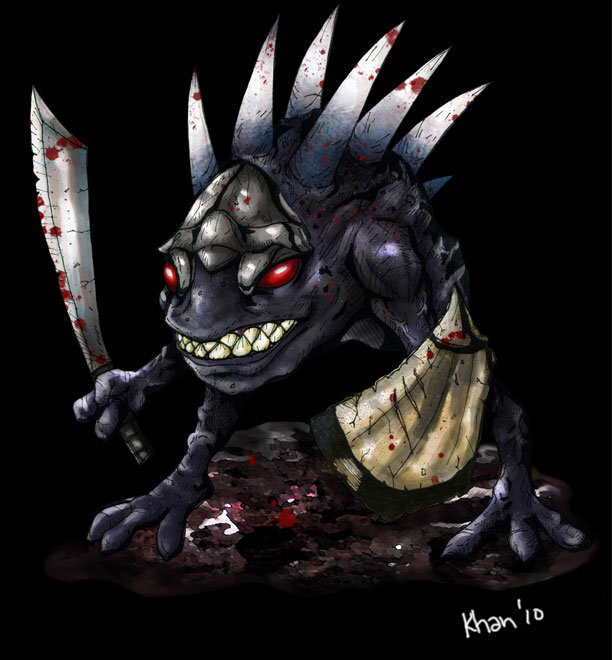 And also if you have the Battlefury you will have cleaving attack to demolish all your opponents. Gives you some additional regeneration on early game. So you can keep farming safely. Your goal in mid game is finding kills. You'll be doing so by using good items in initiating and chasing. A perfect item that makes you can jump and doing combo to your target. After jumping, immediately use Pounce to lock your target. Then use death pact and then attack! POISON DAMAGE: 3 If damage is taken from an enemy hero, dagger cannot be used for 3 seconds. Your goal in late game is to capitalize all you've got from early-mid game. So now you can ready for every big teamfight and become confident that you can take down all enemies. Gives a massive amount of attack speed and evasion so youll be so much more stronger thatn your opponent. Why Boots of Travel? With the creeps becoming more powerful in pushing your base, you'll need a fast teleport to save your Throne. Why Mask of Madness? It will gives you + Attack Speed to destroys enemies quickly. This is what you need as a carry, attack speed. This will also gives you movement speed and lifesteal. Why Basher? Gives you the ability to give stun status to your enemy. Stunned enemy is a piece of cake for you, make you easyly kill him. Upgrade this on late game into Abyssal Blade. With Abyssal Blade, you will have an active 2 seconds stun to disable your foe. Why Desolator? Increase every damage for your target because this item reduces enemy's armor. They have skill that reduce enemy's armor, very synergy with your quick-kill style because you will be able to quick-kill your target easily because your damage will be amplified. Great blog about Dota 2. Thanks author. I found Free Dota 2 Items at GamersNab.com, Click Here to get Unlimited Dota 2 Items for free.